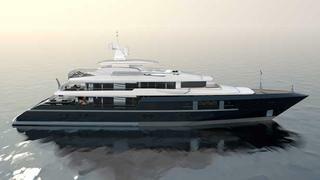 Newcruise has revealed its 60m concept, designed with practical considerations such as berthing and cost-saving in mind. The Hamburg-based design studio embarked on the Touch 60 design, in co-operation with Russian yacht builder Roman Trotsenko of Timmerman Yachts, after feedback from owners and industry figures. They admired Newcruise’s 66.7m Triple Seven and the 73m Siren, but felt a smaller yacht would be more practical, particularly for the Mediterranean where very large berths are scarce. But during the design process Newcruise recognised other practical benefits. The GA plan offers different layout options. Two spacious VIP cabins equipped with side balconies are possible on the main deck, as well as a saloon and dining area. The bridge deck comprises a luxury owner’s suite with study. Further guest cabins are on lower deck. The hydrodynamic displacement hull design offers 15 knots cruising and a maximum speed of 17 knots.